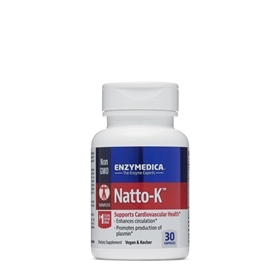 Enzymedica’s Natto-K contains Nattokinase NSK-SD (shown to break down fibrin), and 12 synergistic enzymes to support cardiovascular health. Nattokinase is a potent fibrinolytic (anti-clotting) enzyme complex extracted from a traditional Japanese food called Natto. Natto is a fermented cheese-like food that has been used in Japanese culture for more than 1,000 years for its popular taste, and used as a remedy for heart and vascular diseases. Research has shown that Nattokinase supports the body in breaking up and dissolving the unhealthy coagulation of blood. In fact, it has been shown to have four times greater fibrinolytic activity than plasmin. Nattokinase has been shown to support normal blood pressure, dissolve blood clots and prevent them from forming in the first place! Natto-K is rich in both types of vitamin K. Vitamin K1 is found in green leafy vegetables and makes up about 90% of the vitamin K consumed in a typical Western diet. Vitamin K2 isn’t produced in plants, but by different types of bacteria. It makes up only about 10% of Western vitamin K consumption. It is especially rich in K2, which could reduce bone loss in post-menopausal women. Vitamin K is repeatedly shown to reduce blood clots by slowing arterial calcification, enhance liver function and encourage urine flow. Natto-K with nattokinase blend containing NSK-SD is a particularly potent enzyme formula which may enhance the body’s production of plasmin (the enzyme the body produce to dissolve clots), thus encouraging optimal heart health. Nattokinase can be used preventatively and has proven efficacy. Nattokinase NSK-SD has been the subject of 17 studies, including two human trials. Nattokinase has been the subject of 17 studies, including two small human trials. Researchers from JCR Pharmaceuticals, Oklahoma State University, and Miyazaki Medical College tested nattokinase on 12 healthy Japanese volunteers (6 men and 6 women, between the ages of 21 and 55). They gave the volunteers 200 grams of natto (the food) before breakfast, then tracked fibrinolytic activity through a series of blood plasma tests. The tests indicated that the natto generated a heightened ability to support circulation. On average, the volunteers'' ELT (a measure of how long it takes to dissolve a blood clot) dropped by 48 percent within two hours of treatment. 1 capsule right before bed. For a therapeutic effect, 1 capsule 3 times a day on an empty stomach. More can be taken as needed (up to 6 per day).